Forefathers' Guise is based on an examination of my Southern background. On my family's property, Gilmore-Patterson Farm, my fourth Great-Grandfather and third Great-Grandfather were slave owners. My second Great-Grandfather was an artillery Captain for the Confederated States of America, and my Great-Grandfather was a member of the Ku Klux Klan. Though I've been aware of this past for a number of years, I've never fully considered its cultural significance. In the tobacco sheet, I see every Black hand that filled it during the Jim Crow era. The Spanish Moss, a symbol for the American South, was gathered from the grave site of three generations of my family. The shape of the hood is meant to resemble the Klansman's mask. Though there is a long-standing tradition of costuming among the Pagans of Europe, "Forefathers' Guise" also evokes the African tradition of Masking, and so invites a dialogue on the practice of cultural appropriation. 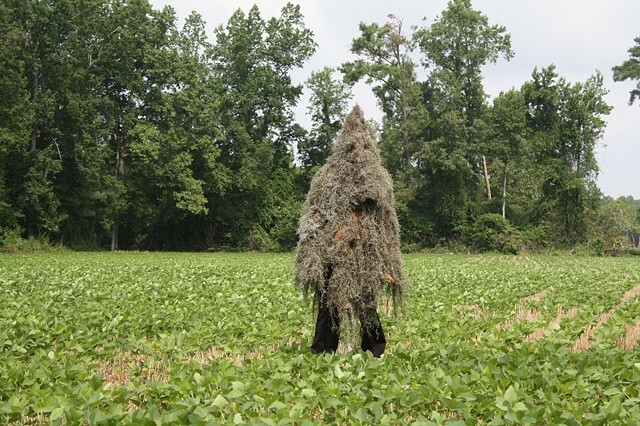 Contemporary comparisons may be seen in the "ghillie suit", a tool of war meant to conceal the wearer's presence. The suit is stuffy, itchy, and quite uncomfortable for me to wear. It is also difficult to remove. This is by design.